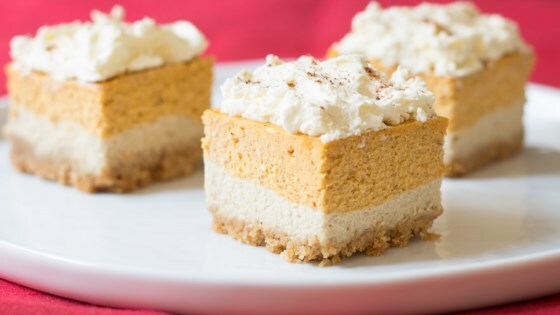 "This creamy treat has got it all - a layer of coffee cheesecake with a layer of pumpkin cheesecake and a buttery graham cracker crust. Serve with some whipped cream and a sprinkle of pumpkin pie spice." Preheat oven to 350 degrees F (175 degrees C). Line an 8-inch baking pan with parchment paper, ensuring there is an overhang on both sides. Mix graham crackers and butter together in a bowl. Press over the bottom of the lined baking pan to make a crust. Beat 8 ounces cream cheese in a bowl with an electric mixer until smooth and creamy. Add 1 egg, 1/4 cup sugar, espresso powder, and 1/2 teaspoon vanilla extract; beat until blended and smooth. Pour latte layer over the graham cracker crust and smooth with a spatula. Clean beaters. Beat 8 ounces cream cheese in another bowl until smooth and creamy. Add pumpkin, 1 egg, 1/4 cup sugar, pumpkin pie spice, 1/2 teaspoon vanilla extract, and cinnamon; beat until blended and smooth. Pour over the graham cracker crust and level with a spatula. Pour pumpkin layer over the latte layer and smooth with a spatula. Bake in the preheated oven until center is just set, 40 to 45 minutes. Cool for about 30 minutes. Cover loosely with aluminum foil. Refrigerate until firm, 3 to 4 hours. Lift bars out of the pan using the parchment paper overhang. Cut into bars using a hot, wet knife. Everything you love about pumpkin spice lattes - in bar form! I followed the recipe exactly, but it turned out just Ok. The texture seems to be off, and the flavors don't really compliment each other. I don't think I'll try again. Took these to a get together; everyone loved them. I will make them again.